If you want to experience first rate service get over to the Fishtale Restaurant and Nightclub and just watch Debbie in action. She has a rhythm that keeps her moving, while keeping an eye on all her customers, acting just before they will call her for something. From the moment you enter, and she tells you to sit where you want and waits for you to decide, to saying goodbye when you leave she does everything right. You won’t have to ask for any drink refills, she will suggest the best items, tell you about all the entertainment they have in the evenings, bring you more bread just as you dunk your last slice into the wine/garlic/oil fluid of your bucket of seafood. She has a sense of humor, knows the menu, treats each of her customers as special people and seems to love her job! 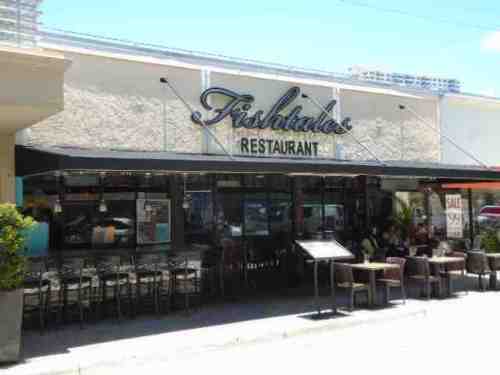 Fishtales Restaurant and Nightclub is more than just Debbie though she is a very important part of the whole ambiance. There are bright neon fish and a mermaid around the room, not to forget that must in every restaurant these day television sets of various sizes. The bar has a eye-catching color scheme, the outside dining area is inviting--but not to me in Florida’s feel like 100 degree temperatures. There is a beautiful white (fake) flower display as you enter and each table has an orchid like decoration. The tables are attractively set and I must admit I loved their salt and pepper shakers! We had a groupon and the total check with tax and tip (25% on original bill) came to $22.66. It was without a doubt one of the best ‘deals’ we have had in a restaurant in a long time and even without the groupon Debbie would have made the whole experience a winning one. I am sure if I had mentioned it was his birthday she would have made a big deal out of it--and he would have killed me! The dining room is impressive at lunch time but I have a feeling it is whimsical, bright and, possibly, magical at night and I can see entertainers enjoying themselves while performing. Thanks Fishtales, thanks groupon but most of all thanks Debbie!